In this project, you will create a visualization of restaurant ratings using machine learning and the Yelp academic dataset. 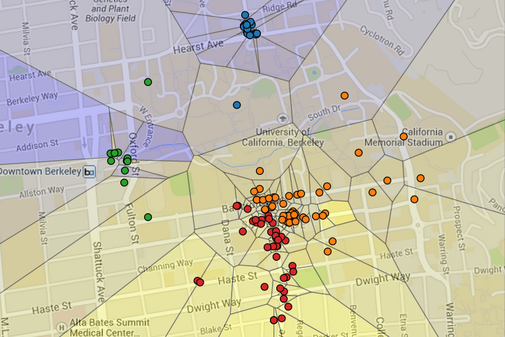 In this visualization, Berkeley is segmented into regions, where each region is shaded by the predicted rating of the closest restaurant (yellow is 5 stars, blue is 1 star). Specifically, the visualization you will be constructing is a Voronoi diagram. In the map above, each dot represents a restaurant. The color of the dot is determined by the restaurant's location. For example, downtown restaurants are colored green. The user that generated this map has a strong preference for Southside restaurants, and so the southern regions are colored yellow. This project uses concepts from Sections 2.1, 2.2, 2.3, and 2.4.3 of Composing Programs. It also introduces techniques and concepts from machine learning, a growing field at the intersection of computer science and statistics that analyzes data to find patterns and make predictions. The maps.zip archive contains all the starter code and data sets. The project uses several files, but all of your changes will be made to utils.py, abstractions.py, and recommend.py. This is a 1-week project, due on Friday, 07/13/18 at 11:59 PM. This is a solo project, so you will complete this project without a partner. You should not share your code with any other students, or copy from anyone else's solutions. The project is worth 22 points. 20 points are assigned for correctness, and 2 points for the overall composition of your program. If you do not want us to record a backup of your work or information about your progress, use the --local option when invoking ok. With this option, no information will be sent to our course servers. All changes in this phase will be made to utils.py. Before starting the core project, familiarize yourself with some Python features by implementing some functions in utils.py. Each function described below can be implemented in one line. These will be helpful in later parts of the project. Implement map_and_filter, which takes in a sequence s, a one-argument function map_fn, and a one-argument function filter_fn. It returns a new list containing the result of calling map_fn on each element of s for which filter_fn returns a true value. Make sure your solution is only one line and uses a list comprehension. Implement key_of_min_value, which takes in a dictionary d and returns the key that corresponds to the minimum value in d. This behavior differs from just calling min on a dictionary, which would return the smallest key. Make sure your solution is only one line and uses the min function. Make sure your solution is only one line and uses the zip function and a range. Note: zip and enumerate are also built-in Python functions, but their behavior is slightly different than the versions provided in utils.py. The behavior of the built-in variants will be described later in the course. Implement the mean function which takes in a sequence of numbers, s, and returns the arithmetic mean, or average, of that sequence. The sequence cannot be empty: add an assert statement to ensure that empty sequences are not allowed. All changes in this phase will be made to abstractions.py. In this phase, we will implement data abstractions to represent a restaurant and its relevant features (such as name, location, and reviews). Complete the implementations of the constructor and selectors for the restaurant data abstraction in abstractions.py. Two of the data abstractions have already been completed for you: the review data abstraction and the user data abstraction. Make sure that you understand how they work. You can use any implementation you choose, but the constructor and selectors must be defined together such that the restaurant selectors return the correct field from the constructed restaurant. When you finish, you should be able to generate a visualization of all restaurants rated by a user. Use -u to select a user from the users directory. You can even create your own by copying one of the .dat files! Omitting the -u argument will default to user test_user. You may have to refresh your browser to update the visualization. All changes in this phase will be made to recommend.py. Restaurants tend to appear in clusters (e.g. Southside restaurants, Downtown Berkeley restaurants, Gourmet Ghetto, etc.). In this phase, we will devise a way to group together restaurants that are close to each other into these clusters. To do so, you will be implementing the k-means algorithm, a method for grouping data points into clusters by determining their center positions (which are called centroids). K-means is considered an unsupervised learning method because the algorithm is not told what the correct clusters are; it must infer the clusters from the data alone. Update clusters. Group the restaurants into clusters, where each cluster contains all restaurants that are closest to the same centroid. In this step, centroid positions remain the same, but which cluster each restaurant belongs to can change. Update centroids. Compute a new centroid (average position) for each new cluster. In this step, restaurant clusters remain the same, but the centroid positions can move. These steps are repeated to update the centroids until either an optimal list of centroids is found, or the centroid locations no longer change significantly each time (based on a maximum update threshold). This visualization is a good way to understand how the algorithm works. As you complete the remaining questions, you will encounter the following terminology. Be sure to refer back here if you're ever confused about what a question is asking. location: A pair containing latitude and longitude. Note that this is not a data abstraction, so we can assume its implementation is a two-element list. centroid: A location (see above) that represents the center of a cluster. restaurant: A restaurant data abstraction, as defined in abstractions.py. cluster: A list of restaurants grouped around a centroid. user: A user data abstraction, as defined in abstractions.py. review: A review data abstraction, as defined in abstractions.py. feature function: A single-argument function that takes a restaurant and returns a particular feature as a number, such as its mean rating or price. Implement find_closest, which takes a location and a sequence of centroids (locations). It returns the element of centroids closest to location. You should use the distance function from utils.py to measure distance between locations. The distance function calculates the Euclidean distance between two locations. It has been imported for you. If two centroids are equally close, return the one that occurs first in the sequence of centroids. Hint: Use the min function to find the centroid with the minimum distance to location. Now, implement a helper function for the first step in the loop of the k-means algorithm, group_by_centroid, which takes a sequence of restaurants and a sequence of centroids (locations) and returns a list of clusters. Each cluster of the result is a list of restaurants that are closer to a specific centroid in centroids than any other centroid. The order of the list of clusters returned does not matter. If a restaurant is equally close to two centroids, it is associated with the centroid that appears first in the sequence of centroids. Hint: Use the provided group_by_first function to group together all values for the same key in a list of [key, value] pairs. You can look at the doctests to see how to use it. Implement find_centroid, which finds the centroid of a cluster (a list of restaurants) based on the locations of the restaurants. The centroid latitude is computed by averaging the latitudes of the restaurant locations. The centroid longitude is computed by averaging the longitudes. Hint: Use the mean function from utils.py to compute the average value of a sequence of numbers. Finally, implement the full k_means algorithm. We've already filled out the first step of the algorithm, which was to randomly initialize a list of centroids. The rest of the algorithm consists of iteratively updating centroids by grouping the restaurants into clusters based on the current list of centroids and recomputing the new centroid for each cluster. Group restaurants into clusters, where each cluster contains all restaurants closest to a particular centroid in centroids. Update centroids to contain the true centroid (i.e. average location) for each cluster. Hint: Use the group_by_centroid and find_centroid helper functions. These two steps repeat until an update doesn't change the list of centroids or after max_updates iterations. Your visualization can indicate which restaurants are close to each other (e.g. Southside restaurants, Northside restaurants). Dots that have the same color on your map belong to the same cluster of restaurants. You can get more fine-grained groupings by increasing the number of clusters with the -k option. Congratulations! You've now implemented an unsupervised learning algorithm. In this phase, you will predict what rating a user would give for a restaurant. You will implement a supervised learning algorithm that attempts to generalize from examples for which the correct rating is known, which are all of the restaurants that the user has already rated. By analyzing a user's past ratings, we can then try to predict what rating the user might give to a new restaurant. When you complete this phase, your visualization will include all restaurants, not just the restaurants that were rated by a user. To predict ratings, you will implement simple least-squares linear regression, a widely used statistical method that approximates a relationship between some input feature (such as price) and an output value (the rating) with a line. The algorithm takes a sequence of input-output pairs and computes the slope and intercept of the line that minimizes the mean of the squared difference between the line and the outputs. First, let's use least-squares linear regression to write a function find_predictor that computes a predictor function for a user based on their existing restaurant ratings. A predictor function predicts a restaurant's rating based on a given feature, such as price or location. find_predictor takes in a user, a list of restaurants that have been reviewed by the user, and a feature function called feature_fn and returns two values: a predictor function and an r_squared value. The predictor function is represented as the line y = a + bx, where y is the predicted rating for a restaurant given x, a feature of the restaurant. The r_squared value measures how accurately this line describes the original data. To compute a, b, and r_squared, start by calculating the sums of squares S_xx, S_yy, and S_xy of the existing data (i.e. the feature values and corresponding user ratings for each restaurant in restaurants). Hint: The mean and zip functions can be helpful here. Now we need a way to decide which feature is the best predictor of restaurant ratings. This can differ from user to user; for example, some users may base ratings mostly on location, while others may base them more on price. Implement best_predictor, which takes a user, a list of restaurants, and a sequence of feature_fns. It computes a predictor function for each feature function and returns the predictor that has the highest r_squared value. All predictors are learned from the subset of restaurants reviewed by the user (called reviewed in the starter implementation). Hint: The max function can also take a key argument, just like min. Now that we are able to find an optimal predictor function for a given user, we can compile a full collection of restaurant ratings for the user, including ratings for restaurants they haven't actually rated yet! Implement rate_all, which takes a user, a list of restaurants, and a sequence of feature_fns. It returns a dictionary where the keys are the names of each restaurant in restaurants and the values are the corresponding ratings (numbers). If a restaurant has already been rated by the user, rate_all will assign the restaurant the user's rating. Otherwise, rate_all will assign the restaurant the rating computed by the best predictor for the user. The best predictor is chosen using a list of feature_fns. Hint: user_rating, implemented in abstractions.py, returns a user's rating for a restaurant given the user and restaurant_name. If you hover over each dot (a restaurant) in the visualization, you'll see a rating in parentheses next to the restaurant name. As a final addition to our visualization, let's add the ability to focus the visualization on a particular restaurant category by implemening search. The search function takes a category query and a sequence of restaurants. It returns all restaurants that have query as a category. In the users directory, you'll see a couple of .dat files. Copy one of them and rename the new file to yourname.dat (for example, john.dat). Replace the second line with your name (as a string). Rate a couple of your favorite (or least favorite) restaurants. (Replace john with your name.) Play around with the number of clusters (the -k option) and try different queries (with the -q option)! How accurate is your predictor?